If you had said to me 30 or more years ago that I would be standing with 6,000 other people watching Duran Duran in 2016, I would not have believed you. I would also have been quite rude about the likelihood of the band still existing, or me being prepared to listen to that type of music. Time, of course has a habit of proving us wrong, of changing our tastes, and of mellowing our teenage rebelliousness and contradicting out declamations. Gradually, one realises it’s okay that pop songs have their fortnight of fame (and sales) and also that as they become golden oldies, they are also part of one’s past. So the 2016 me will now admit to Duran Duran having written some good songs too, that were part of the early 1980s, even if only as background music then. There’s another reason I’ve mellowed. I used to work as a hospital porter in Harrow. And so did a certain Simon le Bon. We were never friends, we just shared shifts. I spent the summer of 1980 teaching sailing and art in Michigan, then travelling around, ending up in New York. Back in the UK, after a few part-time and temporary jobs, I ended up back for a second stint at Northwick Park Hospital. ‘Have you seen Simon?’ said the guys I knew from before. No, I hadn’t, but there he was, a pop star on the television. Anyone who works in the arts and lives long enough, comes across others who become famous, make it big, appear on the TV or have successful exhibitions. It helps make one feel you stand a chance. So, a glorious sunny evening in a converted quarry in Cornwall, with the famous futuristic greenhouse domes as a backdrop to the summer stage set up each year in Eden’s arena. It’s a reassuringly uncrowded place: 6,000 people are enough to make it feel like a mini-festival, like a crowd, but not enough to feel hemmed in or lost. Eden’s bar and food system works well, and – of course – just about everyone else is middle-aged too; it’s a comfortable, reassuring crowd for this event, that makes room for the few toddlers and kids here, and let’s those who need further refreshment or feel the need to be nearer the stage, through. Izzy Bizu are bottom of the bill, and we only hear them from the comfort of the bar and food area; I’ve nothing to report. But Laura Mvula is a definite crowd-pleaser, and seems to be on everyone’s musical map following a pretty sustained BBC support campaign and series of appearances over the last three years. She has a fantastic voice, showcased on her opening song, a recent single, but all too often it’s otherwise buried in a kind of overproduced plastic soul, with only some interesting cello work breaking through. Halfway through her set she performed a song that was almost unaccompanied, which was superb, as was a rendition of the apt ‘Green Garden’. She closed with a new single, that also bodes well, but I hope she can claim back her voice from her producers (and I’m not sure about her keytar either…). Then, after a bit of a wait (it was okay, they played The Doors), and an awful and embarrassing introduction from the non-entities who apparently present the One Show, Duran Duran come onstage to cheers and applause. This was one hell of a slick and accomplished show, but through it all the band seemed as though they were enjoying it as much as the audience did. I didn’t know the current single ‘Paper Gods’ but it was classic 80s sounding: big beefy bass, simplistic keyboards, soaring guitar (newcomer Dom Brown was superb throughout) and enthusiastic dad dancing and backing vocal gymnastics. Having despatched that as an opener, it was straight on into ‘Wild Boys’, as fire spat from the stage floor, then ‘Hungry Like the Wolf’ and ‘A View to a Kill’. Time for a breather with the smoochy ‘Come Undone’ and then into a couple of newer tracks that I certainly didn’t know, and then a great version of ‘Notorious’ with Laura Mvula back on stage as a guest vocalist and some rather stilted and I suspect scripted praise from le Bon about the BBC and their music day. Then it was back to some more hits with ‘Pressure Off’ seguing into a crowd-pleasing ‘Planet Earth’ with everyone expected to sing backing vocals, that suddenly swerved into a Bowie tribute as the band did a fantastic excerpt from ‘Space Oddity’ as spaceman Bowie beamed down from the video screen. After ‘Ordinary World’ things dived into spectacularly dull rent-a-funk for a while, including an embarrassing cover of Melle Mel’s ‘White Lines’. Only the more anthemic ‘(Reach Up for the) Sunrise/New Moon on Monday’ worked for me (I seem in a minority here, it has to be said), and the closing ‘Girls on Film’ reminds me why I didn’t like the band at the time. Again, I was in the minority. They pulled it back with an astonishingly good ‘Save a Prayer’, dedicated to Prince, and end the night with ‘Rio’, as the domes glow softly blue. It’s a long walk up the paths back to the car parks, but it’s been a journey worth making. Duran Duran are great performers, crowd pleasers and musicians. They know just when to add extra keyboards, sax and female vocals; their sound is fantastic; the backing films entertaining, their patter and moves tight and well-rehearsed. I’m quite won over really. 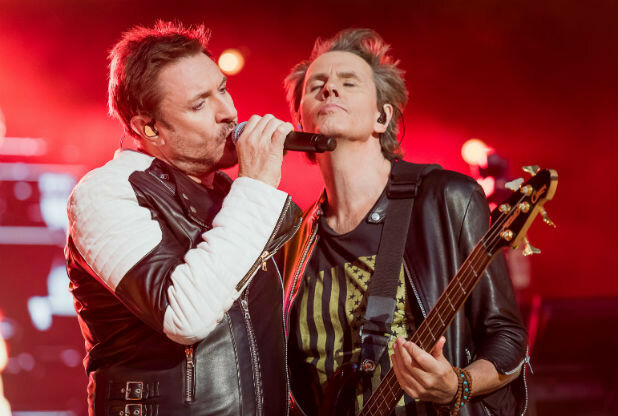 This entry was posted on 10 June, 2016 in homepage and tagged Duran Duran, Eden Project, music review. Bookmark the permalink.